Make sure that the MSDTC (Microsoft Distributed Transaction Coordinator) is enabled on both the servers. Once the Service is started, the next step is to enable the Network Transaction. To allow the distributed transaction to run on the current server from a remote server, select the ‘Allow Inbound’ check box. To allow the distributed transaction to run on a remote server from the current server, select the ‘Allow Outbound’ check box. 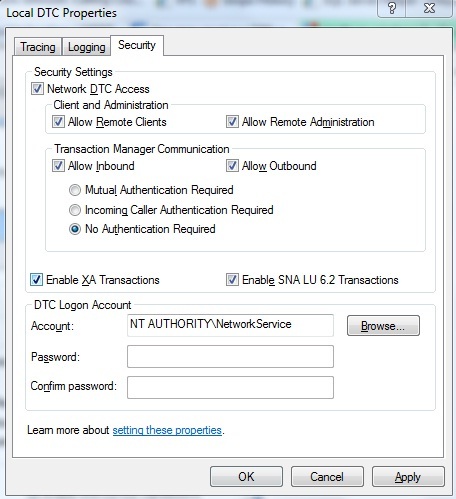 Under the Transaction Manager Communication group, select the ‘No Authentication Required’ option.